HomeMedia CentrePokemon Go: Will It Lead To A Rise in PI Claims? Pokemon Go: Will It Lead To A Rise in PI Claims? With a Clinton running for US president and a new Ghostbusters film in the cinema, you wouldn’t be thought crazy for believing you had woken up in the 1990s. However, it is Nintendo’s latest offering, an augmented reality version of the Japanese game, Pokémon GO, which has evoked the most nostalgia. The interactive game allows users to hunt capture and train Pokémon by using their smartphones as they explore their surroundings. Since its release, people from around the world have become obsessed with ‘catching them all’. Immediately after it became available in the UK last Thursday, it shot to the top of the App Store charts and became the most successful mobile video game app ever as millennials raced to relive their childhoods. 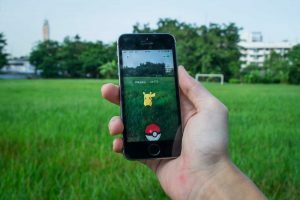 There have been a number of positive effects of Pokémon GO; not only is the game sociable as players bump into others at “Pokéstops” and gyms in their local area, but as they must venture outside to play, it seems to have boosted physical activity. However, it’s not all fun and games for players of Pokémon GO. Despite the game’s opening warning which advises “during game play, please be aware of your surroundings and play safely”, some players have become injured during their attempt to “catch them all”. Individuals are becoming so absorbed in the virtual Pokémon world, that they aren’t paying enough attention to their environment in the real world! In Pittsburgh in the USA, a 15-year old was hit by a car while playing the game. Luckily, she wasn’t seriously injured, but it’s possible that there will be more casualties as the game becomes even more popular. Because of the way in which the game works, by overlaying the locations of the Pokémon over a map of the player’s local area, some individuals have ended up venturing off the beaten track. A couple of people have even gone as far as kayaking into the middle of a lake and others have fallen into ditches to capture a Jigglypuff or Flareon. There have also been players who have been found trespassing after straying onto private property to catch the characters. There have other instances where players have been unable to resist a Pokémon session while driving. While travelling by car will enable you to cover a greater area and catch more Pokémon, this is extremely dangerous and is not advised. Unfortunately, playing Pokémon GO while driving may be the new texting when driving, however it is arguably even more dangerous as it requires greater concentration. In order to make sure that you play the game safely and responsibly. Refrain from playing while driving, cycling, walking near traffic or operating any kind of machinery. It’s important that you are aware of your surroundings, are considerate of those around you and keep an eye on where you’re going. If you’ve been involved in a Pokémon-related accident that wasn’t your fault, you could claim compensation. Get in touch with the personal injury lawyers at Jefferies Solicitors for more information. Our friendly and knowledgeable team will be able to advise you on the potential of your claim and answer any questions you have about the compensation claims process. Enquire online or get in touch by phoning 0800 342 3206.